As part of Nokia’s commitment to advancing industry-leading quality and performance practices, the company is an active member of QuEST Forum. QuEST stands for Quality Excellence for Suppliers of Telecommunications, and it is a unique partnership of suppliers and service providers dedicated to the implementation of a common set of quality requirements, best practices and measurement systems. Participating in QuEST Forum ensures that Nokia's and our customers’ best interests are represented and protected as changes are made to TL 9000, the ICT-specific quality management standard based on ISO 9001. Nokia works hand-in-hand with other ICT companies to address quality issues relating to current and future technology developments. Deepti Arora, Nokia’s vice president of Networks Quality, presenting at the QuEST Forum Best Practices Conference in Tokyo 2015. 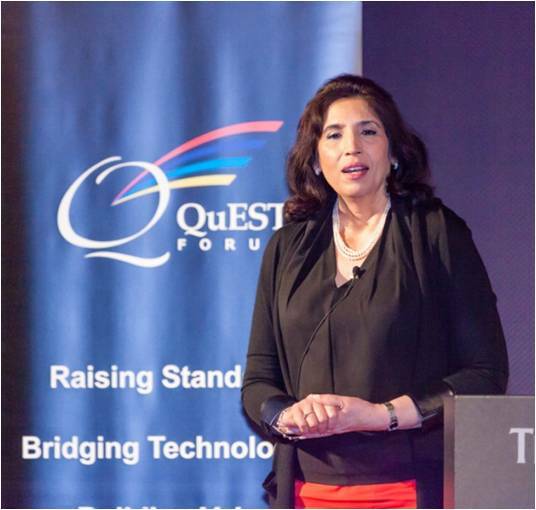 Deepti Arora, Nokia’s vice president of Networks Quality, serves as a member of the QuEST Forum Board of Directors as well as sponsors a strategic initiative focused on the cost of poor quality (CoPQ). This initiative involves 12 ICT companies working together to develop industry benchmarks by defining and normalizing CoPQ elements. Given the importance of this initiative, Deepti Arora has been invited to speak on this topic at QuEST Forum’s three regional Best Practices Conferences. She delivered an executive presentation at the Americas Conference last September in Florida and at the Asia Pacific Conference in Tokyo earlier this month. Next is the EMEA Conference coming to Munich in June. Clearly, the conversation around the cost of poor quality is expanding. Thanks in part to these substantial contributions, Nokia earned QuEST Forum’s 340 Club Award for the third year in a row. This honor recognizes Nokia’s Diamond Sponsorship of the three regional Best Practices Conferences as well as our employees’ participation in QuEST Forum events, work groups, and sub-teams. Our 2014 contributions included vetting next-generation product KPIs, creating guidance documentation, and developing auditor methods. In addition, Nokia and other key suppliers involved in the benchmarking workgroup established a set of service performance metrics and began to benchmark these metrics across the industry. Also in 2014, Nokia helped start the TL 9000 Rev. 6.0 ICT Quality Management Systems Requirements standard, which will be released in conjunction with the new ISO 9001:2016 revision. Please share your thoughts on this topic by replying below - and join the Twitter discussion with @NokiaNetworks using #NetworksPerform #mobilebroadband #Nokia #quality. As a member of the Nokia Quality team, Monique is passionate about promoting a culture of quality. In her private time, she devotes herself to books, kids and canines.